1 Aren’t Interactive Dog Toys Expensive? Aren’t Interactive Dog Toys Expensive? One common concern that pet owners have when it comes to interactive dog toys is that they feel they are going to be costly, and not worth the investment. Some pet owners may have dogs that tear their toys to shreds over time, and it may not seem worth it to spend more on a toy that will be ‘interactive’. The good news is that this is a common misconception! These toys are actually not too expensive at all. Sure, you can get some that are pricier than others, but there are some that are very affordable. If you want to choose the very best toys to keep your pup challenged, you will want to make sure that you look at a variety of toys. Some of them are going to be pretty simple, while some may be much more interactive and offer a treat reward for successfully completing a puzzle or game. The key is to take a look at the various toys and think about what interests your dog most. If they love balls, look for an interactive ball. If they like puzzles, take a look at some of the fun puzzle games for dogs. The StarMark Bob-a-Lot Interactive Dog Toy is a great treat dispensing toy that your dog is sure to love. 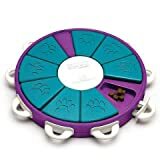 It holds up to three cups of dog food or treats, and it even has adjustable openings so that you can regulate the difficulty. It only comes in one size, but this one size is suitable for dogs of any size. It even has anti-slip technology on the bottom to keep it from toppling over. It is made up of hard plastic, which means that it is durable, so it will stand the test of time even with the toughest of dogs! Priced under $15, this is a great deal. 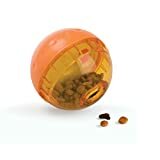 Another great treat dispensing toy that you will want to consider is Our-Pets Smarter Toys IQ Treat Ball. It comes in two sizes, the 3” and the 5”. 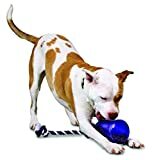 If your dog loves balls, then this is a great choice! It is not only affordable, but it is also durable and it allows you to adjust the difficulty as your dog becomes familiar with it. As your dog rolls it around the floor, treats will spill out. They will love the challenge, and the reward that they get in the end. This ball is actually priced under $10, so it is a steal of a deal, especially considering the hours of enjoyment that your pup will get out of it! If you are looking for a treat dispensing ball, then this is definitely the one that we recommend. The Kyjen Hide-a-Squirrel Squeak Toy is a hide and seek toy that offers hours of interactive play for your pup. It will not only keep them occupied and help to eliminate boredom, but it also helps to increase their IQ and improve their problem solving skills. It is available in several sizes, including the Junior, Large, Jumbo, Ginormous and Anniversary sizes, each offering fun tailored to your dog’s size. Worried that your dog may lose some of the squirrels? Don’t worry about it. You can get replacement squirrel squeak toys for around $5 for a pack of 3. It’s an affordable toy that will really challenge them and teach them the concept of ‘hide and seek’. For those that are looking for a more innovative game, and are prepared to pay a bit more for an interactive dog toy, then Nina Ottoson’s Dog Twister may be a great choice! It is a game that you can play with your pet, and it helps to aid in training your pet to follow simple commands like sit, stay and find. It is durable, and you can easily clean it by putting it on the top shelf of your dishwasher. It is even fun for cats! You will probably pay somewhere between $40 and $50 for this toy, but consumers say that it will stand the test of time and is well worth the investment. It will surely help to challenge your dog’s brain, and will also help you to spend fun, quality time together – oh, and it dispenses treats too! For those that want something that offers a bit of variety, the Dogit Mind Games 3 in 1 Interactive Smart Toy is a great selection. Priced under $20, it offers interactive fun for both you and your dog. It is 3 toys in 1, and it has a strong suction cup that helps to keep it in place. It helps your dog to focus their attention, and it also helps to reduce hyperactivity. It is ideal for small to medium size dogs, and it holds treats. The games include a hide and seek game, a spin a whirl game and a sliding puzzle game. Just when your dog masters one game, you can switch it up on them to keep their brain constantly having to think about what they need to do. If you stick to the same interactive game all the time, they may get bored with it soon. This game offers variety. The Trixie line of interactive games for dogs is really pretty neat. They offer a variety of different games, each on different levels. The Trixie Chess Game is great for chess enthusiasts that want to teach their dog the tricks of the trade (well sort of anyway). This game, however, is for more advanced players and is ranked at a Level 3. If your dog is just starting out, try out the Trixie Bone Game, which is a Level 1-2 game. Starting out with the Trixie Chess may be overwhelming, but really bright breeds may pick up on it quickly. They learn to lift cones up, move sliders, stack and use the cones as stoppers. It is a mini-version of chess that really requires your dog to think. 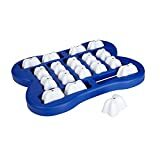 Typically, you can find this game for around $25 or so, and most people find it well worth the investment if their dog is able to pick up on how the game is played. It may take some time for them to learn, but dogs are usually pretty smart. 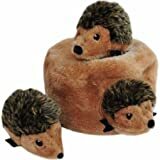 The ZippyPaws Burrow Squeaky Hide and Seek Plush Dog Toy is somewhat similar to the Kyjen Hide a Squirrel Squeak toy, but you have many different options to choose from. They have the Monkey ‘n Banana, the Hedgehog Den, the Burrow Log & Chipmunks, The Dog House, the Sheep Pen, the Aquarium, the Zoo, the Bunny, and even holiday options like the Halloween Spooky Gravestone Burrow or Haunted House Burrow or the Holiday Reindeer Pen Burrow for Christmas! No matter what the occasion, ZippyPaws has something that will be perfect for your dog! Most of their toys range in price between $10 and $20, depending on availability. Your pup is sure to love it, and it is a way to stay festive for holidays and change up their toy selection throughout the year. Nina Ottosson has so many great interactive games that you can play with your dog. The DogFinder interactive game helps to keep your dog on their toes. They will move the blocks on the game in different directions and look for treats. It is something that you can play right along with your dog, much like the Twister game. It is also dishwasher safe, and easy for you to clean. While it doesn’t give a specific level of difficulty, this game is probably considered a level 1-2 game, which means it is great for beginners. If your dog is new to interactive toys, then this is a great one to start out with. Another toy that you will probably be able to find for under $15 is the PetSafe Busy Buddy Tug-a-Jug Meal Dispensing Dog Toy. It is available in four different sizes ranging from extra small to extra-large. It is interactive, giving your dog a multi sensory appeal that keeps them engaged and interested. It is made up of durable, nontoxic materials and is easy to clean. The textured rubber wrap around the toy helps to provide dental care for your pup. Fill it with treats, and watch them enjoy figuring out how to get to the treats! It is pretty durable as well, so if you have a tough chewer, this is a good choice. You can use it for playing fetch, tug of war, and other fun interactive games with your dog. For dogs that love puzzle games, you definitely want to take a look at the Ethical Pet Seek-a-Treat Shuffle Bone Dog Puzzle. This puzzle offers your pup with mental stimulation, and it also rewards them when they complete the puzzle correctly. It isn’t the average dog IQ puzzle. You can put your dog’s favorite treats inside, and then they will be able to shuffle the puzzle around to find the treats. If your dog is new to puzzles, this is a great starter puzzle as well. As for difficulty, this one isn’t too tough, but it also doesn’t have options to increase the difficulty level. The good news is that your dog will never grow out of this toy! They will continue to get a lot of use out of it as they grow and mature, and will still love it when they are in their golden years.